The Fragile X Files: Fragile X Writers Series - He Drove. Fragile X Writers Series - He Drove. We'd never underestimate our children, would we? Of course not. But they have Fragile X. It's a genetic fact. It holds them back. There's so much they would never be capable of doing. Or is there? Cara Capela hails from Livingston, New Jersey and she and her husband have an eight year old son with Fragile X. Hayden is a precocious and creative child - something I believe you agree with wholeheartedly in the next few minutes. Today, Cara Capela shares with us a story of horror and bravery. A perfect example of "truth is stranger than fiction," this story will shock and surprise you, and make you reevaluate what you believe your child is capable of. Cara blogs at AwareneXs, and I thank her deeply for telling us this cautionary tale. Allow me to preface this with a perspective of our experience, with a child who has global developmental delays: at eight or nine months of age Hayden learned to sit up, at 15 months of age Hayden learned to crawl, at 19 months of age he took his first steps, and by 21 months of age he was a confident walker. One day, somewhere between the crawling and the first steps, imagine my surprise when I was home with him and suddenly heard a loud crash. I had gone in the other room for a minute and Hayden attempted to use our floor-standing tower fan to pull himself up. The fan fell over and pierced right through the glass-sided curio cabinet like a torpedo. By some miracle, not a single shard even touched him. I know I was not the only first-time parent who read about what to expect, but this was one of many eye-openers: the fact that all of the child locks, anchored furniture, and covered sharp corners in the world can not prevent every accident. So after the glass was replaced to repair the cabinet, my father custom-made a large three-sided panel of Lucite to go around the bottom half of the cabinet. If only it was realistic to have such an enclosure to protect our children forever. Approximately two and a half years later, on a typical weekday morning, I got Hayden ready for school and then started to get myself together for work. I would always get ready in stages (pretty much still do)… for example, shower and then go check on him… get dressed and then go check on him… start on my hair and then go check on him… etc. This is familiar routine to me, and our home is so cozy in size if you will, that the stopping-starting factor is hardly a bother. So this one day in particular I was at the start-on-my-hair stage, when I realized the house was too quiet. Even from the farthest end of our ranch-style home I can still just barely hear the television from the living room. I walked through the house, legitimately confused, and then I heard what sounded like… my truck. I looked out the window and sure enough, my big blue Chevy blazer was backing out of the driveway. Let me just interrupt this moment to tell you when I was a child, one of the superpowers I imagined having was the ability to fly. Decades later I discovered I could. I am fairly certain my bare feet never touched our eight front steps that day. When I reached the hood of my truck Hayden was momentarily stopped. As he backed out of the driveway, he actually turned the wheel in the correct direction so the truck was appropriately angled to head down the hill and out of our neighborhood. 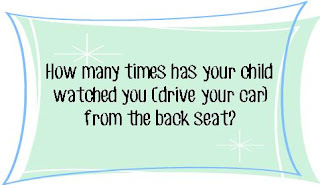 As a matter of fact, he had even braked in time so that the rear tires were at the grass line of the neighbor’s front lawn across the street. I do not know how, but the driver side door was unlocked. There was no time to move Hayden out of the way, so it’s possible I was partially sitting on top of him as I drove the truck with the driver’s door still open and parked it back in the driveway. Quite surprisingly, because our child tends to be rather empathetic, Hayden did not seem phased by my physical reaction to any of this. Not even the horror most certainly visible upon my face, my sobbing, my uncontrollable shaking… nothing. He reacted to none of it. After we both got out of the car and our feet were safely planted on the ground, I probably pressed the lock button on the remote more times than was necessary. At this point I could barely stumble up to our front door, let alone force Hayden to follow me, but luckily he did… without any argument. The last thing I recall before shutting the front door behind us was the neighbor next to the one whose lawn Hayden did not quite drive over—the only neighbor we do not get along with—watching us from his front steps. I don’t recall the exact date believe it or not, but it’s because of what he said to me afterwards that I know the incident happened when Hayden was around five years old. This was the age when his speech finally began to emerge, and prior to that he would not have been able to tell me what he did. So let me backtrack here for a second. Our Hayden, now almost eight, who still to this day has global fine motor and gross motor delays, who still to this day needs assistance with various self-help skills, who still to this day does not yet print his full name, who still to this day does not quite know how to call someone on the phone… almost figured out how to get himself to Shoprite. And that was two and a half years ago. The amount of motor planning he had to accomplish to get as far as he did, is astonishing. First, he waited until I retreated back to my bedroom to continue getting ready. Then he had to maneuver the heavy dining chair in front of the kitchen sink. Next, he had to climb onto it to stand up and reach the windowsill to get to my keys. He obviously made it back down okay, left the chair out of place, but remembered to take play money out of his toy cash register. He then proceeded to get a pair of shoes on, leave the house, and close the front door behind himself. But that’s just the beginning. He now had the keys and needed to figure out which tiny button would unlock the truck. And I know he didn’t push the red one, which most children would be attracted to, because I would have heard that. Next he had to figure out which of the various keys on my keychain is the one that goes in the ignition. I still can’t figure out how he knew which pedals to push, or if was just sheer luck that he didn’t ram the truck head-first into the retaining wall. But as far as the correct gear and the direction he needed to turn the wheel… well, the experts have always said these kids with Fragile X are very strong visual learners. 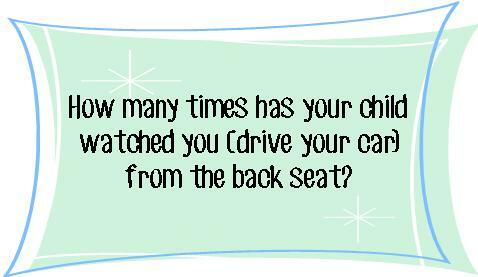 How many times has your child watched you do that from the back seat? As far as his spontaneous ability to pull this off, we also know while many typical children are eagerly proud to show their skills, people with Fragile X tend to exhibit anxiety or frustration instead. Of course it was not entirely because no one was watching that he was able to go ahead and attempt running an errand—I mean, it’s not like the child whips up a gourmet meal when I turn my head—but clearly they have more abilities than we may realize. In addition to no longer keeping my keys on the windowsill, we have since installed extra interior locks at the top of each doorframe as well. There are other preventative measures you can use such as an alarm system, security cameras, etc. The Capela family, featured on a banner at the 13th International Fragile X Conference. But I think the most important take-away is that our kids are able kids. Well that, and not everything there is to expect will end up in a book. But if it did, Chapter 101 should simply read: “Always remember to hide your keys in a safe place; it could save lives.” Clearly Hayden’s life was not the only one in danger that morning. I wish that this significant day could be remembered as more of an accomplishment versus a terrifying moment in time… and I wish that I could have told Hayden just how proud I was that he successfully attempted to accomplish something which I still can not believe I witnessed… but obviously I would never praise him under such circumstances. The good news is there will be much better opportunities to be amazed. And thank you, Bonnie, for allowing me the opportunity to share this story.